The 14th and final Bernie Gunther novel takes the world-weary investigator back to the beginning: Berlin, 1928, the eve of the Nazi rise to power, with Gunther just promoted to the Murder Commission, and two serial killers on the loose. Published posthumously, Philip Kerr’s swansong, Metropolis, is another masterpiece — which is a word that gets thrown around too easily, but is thoroughly deserved here, and almost an understatement. Kerr created one of crime fiction’s greatest characters in the sardonic anti-hero Bernie Gunther, and by plunging readers backwards and forwards in time through Gunther’s life, exploring his post-war and Nazi era antics, Kerr concocted a thrilling tapestry of a life lived in a time of great turmoil; when Gunther’s moral code, his lethal wisecracks, and the quality of the novels he starred in, were the only guarantees, because you never knew where, and when, Gunther might pop up next. In his first case for the Berlin Murder Commission, Gunther is plucked from Vice to hunt for a serial killer targeting prostitutes, whose calling card is slicing the scalp from his victims. Then a new killer strikes, who has their sights set on the city’s disabled war veterans, and Gunther is forced undercover as a homeless veteran, which forces him to confront his own memories of the war. But it’s not just the threat of dual murderers that has Berlin on edge; Nazism is on the rise, blackening hearts, stoking violence and anti-Semitism. You’ll turn the pages as fast as possible to identify the killers; then go back to truly savour Bernie Gunther’s perspective on Berlin in 1928; not to mention his interactions with historical figures such as Thea von Harbou and Lotte Lenya. That’s the beauty of Philip Kerr’s fiction: they’re mesmerizing for both plot and character, and their blurring of truth and fiction, which is often closer than readers might imagine. At the stage of his career when many other thriller writers struggle for new ideas or settle on conventional, repetitive plots, Philip Kerr continues to crank out electrifying, utterly addictive novels of suspense. The thirteenth book in Kerr’s long-running series, Greeks Bearing Gifts opens in Munich, 1957, with Bernie Gunther, the one-time Commissar of the Murder Commission, now working under the pseudonym “Christof Ganz” as a morgue attendant, desperately trying to leave his past behind, and live whatever remains of his future in relative peace. But the past is something that won’t let go, and it reappears in the form of a dirty cop, and a lethal trap, which Bernie escapes, though barely. Thrust into a new career as a claims adjuster for a prominent insurance company thanks to the influence of powerful attorney Max Merten, Bernie is dispatched to Athens to assess the sinking of a ship. But his simple mission turns into something far more dangerous when he discover’s the ship’s owner, former Wehrmacht Navy man Siegfried Witzel, shot dead through both eyes. Compelled by the Greek cops to investigate, Bernie’s once again drawn back into the dark history of WWII. Inspired by real people and events, Greeks Bearing Gifts is emblematic of why Philip Kerr’s Bernie Gunther books are far more than a guilty pleasure. There’s the central mystery to unravel, of course, and plenty of nerve-shredding tension along the way; but there’s always another layer to Kerr’s work, in this case an exploration and analysis of Adenauer’s amnesty for Nazi war criminals, and Bernie’s struggle to fit into this new Germany and its willingness to move on from its checkered past. Brilliantly composed and elegantly constructed, Greeks Bearing Gifts is a masterful historical crime novel, and leaves Bernie Gunther in a tantalising place for the future that will assure readers this is not the end of our journey with one of the finest anti-heroes in literature. I had two thoughts when I was handed a proof copy of the new Bernie Gunther thriller. The first, obviously, was: Yessssssssssssssss! Which I might’ve vocalised too, come to think of it, right there in the middle of the store, in front of customers. My second thought: Look at the size of that thing! Because it’s a fat book, Prussian Blue, clocking it at over 500 pages. Not that it felt like it once I started reading. The twelfth Bernie Gunther novel is just as unputdownable as its precursors, this time flicking back and forth between Nazi Germany in 1939 and the French Riviera in 1956, with two seemingly unrelated tales eventually tying together. The French Riviera, 1956: Bernie is forced to flee France for West Germany after refusing to carry out a hit for Stasi chief Erich Mielke, killing a Stasi agent in the process. Nazi Germany, 1939: Bernie is dispatched to Hitler’s mountain retreat in Berchtesgaden, where a sniper has assassinated Karl Flex, a civil engineer in Martin Bormann’s employ, on the deck of Hitler’s villa, the Berghof. Bernie must solve the crime before Hitler returns to Berchtesgaden to celebrate his 50th birthday. At its heart, Prussian Blue is a whodunit, easily enjoyed as an archetypal police procedural, if that’s all you want from your crime fiction. What elevates it above its competition is the context in which Bernie must run his investigation: amidst the corruption and brutality of the Nazi regime. As always, the verisimilitude of Bernie’s world really shines through, and his wit is drier than ever. With Gunther, Philip Kerr has created the perfect vehicle to explore the grey edge of morality; but one must think it’s only a matter of time before he’s pushed from that precipice. In a standout series, this is one of its best. Prussian Blue will be lapped up by long-time fans, who’ll already be awaiting the confirmed thirteenth Bernie Gunther caper, Greeks Bearing Gifts; for everybody else, this is a fine place to start your love affair with Kerr’s roguish detective. Then again, you can’t really go wrong. Philip Kerr and Bernie Gunther are that good. Philip Kerr is a novelist who has mastered the art of blending fact and fiction, convincing the reader that the events taking place must be real. His mastery of place and dialogue is extraordinary and unrivalled. Every new Bernie Gunther novel is something to look forward to, and The Other Side of Silence ranks right up there with the series’ best, and a must-read for fans new and old. The war has been over for more than a decade in Philip Kerr’s new book starring former German detective Bernie Gunther. But for a guy who survived that conflict – – who should perhaps be counting his blessings having lived through so much – – is exceptionally weary. In fact, when The Other Side if Silence begins, he is contemplating taking his own life; not that it’s really his life, because in 1956, Gunther is living under a pseudonym and working as a hotel concierge on the French Riviera. The life he knew is over. Now he spends his days trying to stay off the radar and keep out of trouble; purposefully boring and uneventful. But of course, for a man like Bernie Gunther, trouble is never far away, and this time, that trouble takes the form of Anne French, an English writer, and an old wartime acquaintance named Harold Henning, who was responsible for the death of thousands – including one of the loves of Bernie’s life. These two forces pull Gunther into a blackmail plot involving one of Britain’s most famous writers of the 20th century, W. Somerset Maugham, and the Cambridge Spies. These ingredients make for one of Kerr’s best novels yet. Seamlessly blending historical fact with thrilling fiction, THE LADY FROM ZAGREB plunges Bernie Gunther deep into morally ambiguous waters, as the Nazi-hater is drafted into a scheme by Goebbels, the Minister of Truth and Propaganda, to entice Dalia Dresner, a young actress, into resuming her filmmaking career. She’ll comply, on one condition: that Gunther travel to savaged Yugoslavia to find her estranged father and deliver a personalised letter. And while Gunther is no stranger to the horrors of war, and the bleak reality of Nazi Germany and its machinations, he is shocked by the level of depravity he witnesses during his journey, which climaxes with gunshots in Switzerland, alongside a stunning revelation. Of course, the tenth Bernie Gunther novel is packed with the historical detail readers have come to expect, and demand. But whereas lesser writers might struggle with that baggage, of interspersing their research with a compelling narrative, Philip Kerr stylishly integrates the two elements. 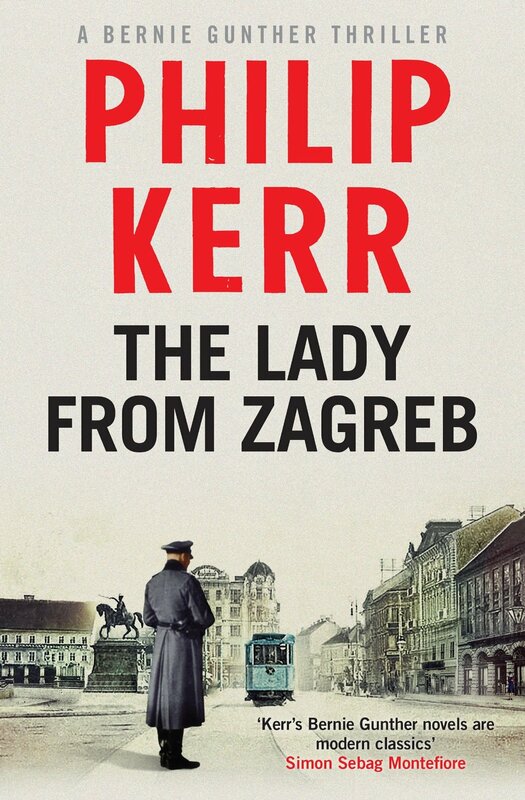 THE LADY FROM ZAGREB reads like a hard-boiled crime novel – the first-person perspective is delightfully Chandler-esque – and maintains its unrelenting pace throughout its four-hundred page length. History buffs will appreciate the lengths Kerr goes to in order to maintain the sanctity of his yarn, while readers merely seeking a good crime novel will be sated, rather than overwhelmed by the heavy research that was evidently undertaken. It is Gunther himself, the sardonic, morally-comprised protagonist, who ultimately elevates THE LADY FROM ZAGREB from its competition. It is impossible not to feel sympathy for poor Bernie, a proud German who is disenchanted by his nation, as he struggles for equilibrium among the Nazi party, the Gestapo, the SS, the SD, and the Croatian Fascists, the Ustase. A good man, whose moral compass is forced askew because of external circumstances. His eleventh escapade can’t come soon enough.